Sakineh Ashtiani was convicted of adultery in 2006 after being subjected to 99 lashes. (CNN) -- Hundreds of protesters rallied worldwide Saturday against the imprisonment and possible execution of an Iranian woman convicted of adultery. Sakineh Mohammedie Ashtiani was originally sentenced to death by stoning, but it was put on hold earlier this month after an international outcry. In London, protesters held posters with Ashtiani's likeness while a speaker criticized Iran's treatment of her. Many demonstrating in Trafalgar Square held signs reading, "No to Stoning. No to Executions." John Lennon's "Imagine" played in the background. 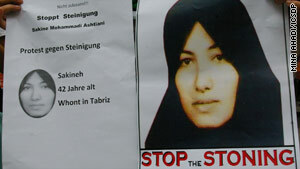 In Stockholm, Sweden, protesters chanted for Ashtiani's release while calling stoning a medieval practice that must end. They also signed a large petition calling for her release. The case has drawn international attention. Ashtiani was convicted of adultery in 2006 and faces the possibility of execution. The London protesters said Iran has unfairly sentenced others to death, including 18 gay citizens. In Toronto, Canada, one woman showed a graphic display with red-colored stones to symbolize the instruments and results of stoning. Despite the sentencing delay, human rights activists wanted to remind the world of Ashtiani's plight, said Mina Ahadi, chairman of the International Committee Against Execution and Stoning, one of the group's leading Saturday's protests. "The fact is, the execution can still happen," Ahadi said. "And, often times in Iran, these types of executions will happen without any notice." More than 30 cities participated in "International Sakineh Mohammedie Ashtiani Day" at 2 p.m. local time. Cities holding rallies included Washington, New York, London, Venice, Paris, Berlin and Ottawa, organizers said. Organizers hoped the rallies would help free Ashtiani and intensify the international support she gained earlier when her case was widely publicized. "International pressure is what causes change," Ahadi said. "The authorities in Iran aren't immune to this pressure -- we want to release Ashtiani, and we think these rallies are a huge factor in doing so." Earlier this month, Ashtiani's lawyer, Mohammad Mostafaei, told CNN that she confessed to the crime after being subjected to 99 lashes. She later recanted the confession and has denied wrongdoing, he said. Iranian state media reported this month that the nation's judiciary chief halted the execution of Ashtiani. "Although the verdict still stands and is definite, the execution has been halted on humanitarian grounds from the order of the honorable judiciary chief, and will not be implemented at this time," Malek Ajdar Sharifi, a judiciary official in East Azerbaijan province, told Iran's Islamic Republic News Agency. Human rights activist Maryam Namazie said Saturday's protests are critical for freeing Ashtiani. "Very often the regime has quietly and privately executed people even though it said it's not going to," said Namazie, spokeswoman of Iran Solidarity and One Law for All. CNN's Karen Smith contributed to this article.